A well-known home builder who catered to the rich and famous in the Hamptons was on a small plane that crashed into the ocean, officials said Sunday. Wale Aliyu reports. A well-known home builder who catered to the rich and famous in the Hamptons was on a small plane that crashed into the ocean, officials said Sunday. Bernard Krupinski and his wife, Bonnie, both age 70, were aboard the Piper PA31 that crashed Saturday afternoon, East Hampton police said. Also onboard was their 22-year-old grandson, William Maerov, and the pilot, Jon Dillard, 47, of Hampton Bays. Bernard Krupinski's clients included Martha Stewart and Billy Joel. Krupinski grew up in East Hampton before starting his business, Ben Krupinski Builders, there. The couple owned and developed many parts of the Hamptons, including Italian eatery CittaNuova, which was closed on Sunday in honor of the family. They also donated time, effort and money to various projects in the area. 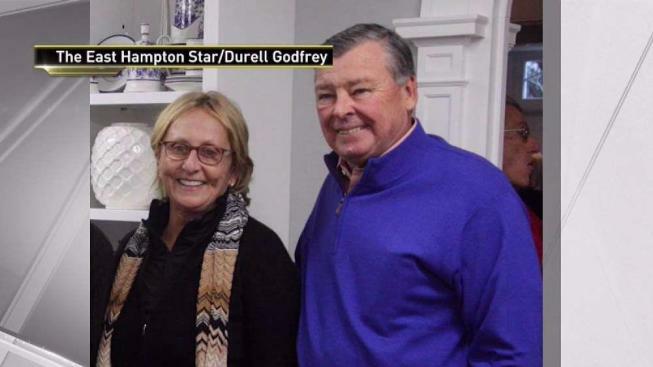 "There's no one else who has given so much, and they really didn't do it to draw attention to themselves or praise to themselves," East Hampton town supervisor Peter Van Scoyoc told NBC New York. "They did it because it was the right thing and they really cared about people in this town." In a statement on Sunday, Joel said he was "shocked and saddened to hear" of the Krupinskis' deaths. "Ben undertook to get my East Hampton house project completed in the 1980s when the construction progress had been stalled due to bad management. He was always a gentleman and a fair person to deal with. I liked him personally very much, as well," Joel said. "Ben and Bonnie were always quietly doing good things for the community. They will be greatly missed in this part of Long Island," the musician added. Krupinski's plane had been heading to East Hampton Airport, the Federal Aviation Administration said. It lost contact with the East Hampton Tower approximately a mile from the airport, the East Hampton Police Department said. There was extreme weather in the region at the time. Two bodies have been recovered. The search for the remaining two bodies was called off Sunday afternoon due to deteriorating sea conditions, police said. The FAA and local authorities are investigating the crash. Small planes and helicopters are popular travel options for people with the means to avoid the bumper-to-bumper traffic on the Long Island Expressway.